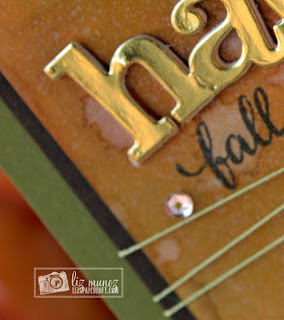 Liz's Paper Loft: MCT September Release Sneak Peek Day 1 ~ happy fall! MCT September Release Sneak Peek Day 1 ~ happy fall! Good morning today is Day 1 of My Creative Time's September Release Sneak Peeks and I get to share with you, Happy Everything stamp and die set! This is the set you've been waiting for! Really the name says it all! To create the background I did a watercolor smash up...the only way to explain it is, I laid my paper on my watercolor palette and smashed it around then left it to dry. After it dries I dropped water on it and let dry, then I sprayed it with shimmer and let dry. Once it was completely dry I stamped my images. The hardest part is being patient with the drying process. Such a beautiful kard, so creative. What a great technique!! Thanks for sharing. I will definitely be giving this a try! It's not going to look as amazing as yours but I'll try! Really cool card for the Fall. I love the rustic look of this card and the colors. I am looking forward to the rest of the release this week! TFS! 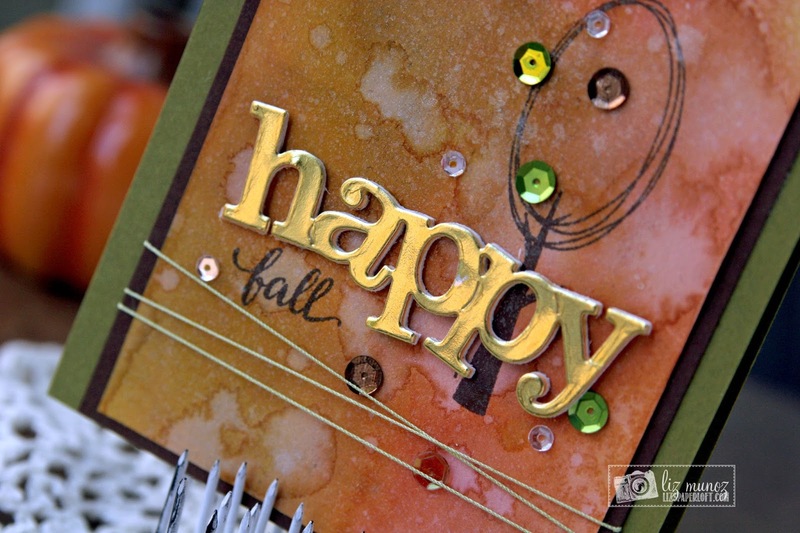 Love your HAPPY Fall card! Love the colors!!! OMG Miss Liz What a Gorgeous Fall Card!! WOW your water coloring is so beautiful...love the clever and creative ways you've used Miss Emma's goodies. Once again you've created an outstanding shabby/chic vintage look. YOU so ROCK!! Very pretty! Love the water coloring!! Very pretty card ... Love the gold! Your watercoloring is gorgeous, and I love the tree stamped on it! Just beautiful! Fun watercolored background. Perfect Fall colors. I love this!!!!! Love the watercoloring! the background really speaks fall. Very pretty fall card----Yay! fall is almost here---good job and thanks for sharing. 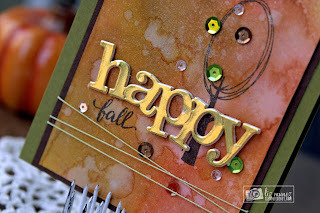 Oh my, what a fun Fall card! Love the edge die you used, too. I have the edge die set and need to use them more. Thanks for sharing! 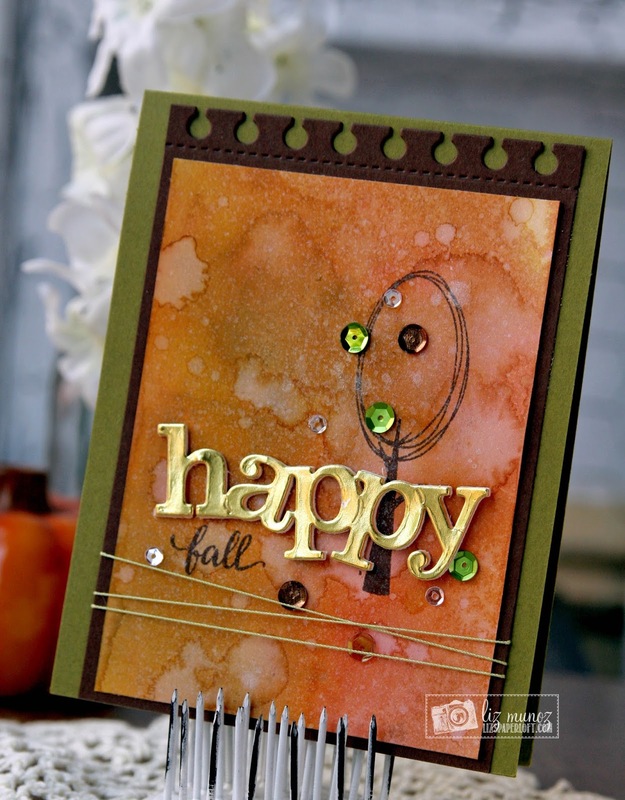 Great fall card and thank you for sharing your technique with us. Background turned out great! LOVE the golden "Happy" on this card for sure. I'm really loving this new sneak peak so far. What a lovely fall card! The gold Happy is the perfect touch! Pretty card and a wonderful background technique for this super die. Beautiful Fall card!! Just love the "happy" die!! All your efforts were really worth it, that is a gorgeous card. Love the Fall colors. Your water-colour 'smash-up' is absolutely stunning; beautiful rich colours that showcase the new die fabulously! The smashed background looks awesome and so fallish with the colors used. I love the simple tree stamped and the gold happy! This is such a useful set to use. Beautiful card. Super cute as always! I need to use that tree more because it's just too cute. Love your watercolor background too. What a cute Fall card idea. Thanks for sharing. Great fall colors for a fabulous card! Your patience paid off big time! Beautiful! So so AWESOME Liz! Loving your watercolor background! Okay LIZ ~ this is STUNNING! The background is GORGEOUS and the Happy in gold is so perfect too! LOVE this!